American Institute of Beauty, Inc. (AIB) would be nothing without our incredible faculty and staff. 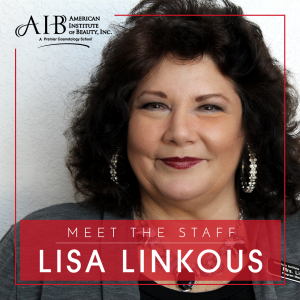 Lisa Linkous, often called “Mama Lisa” by her students, is one such member of the AIB family who works tirelessly to help students and clients alike feel special. She has been with AIB for over 15 years, and brings a wealth of experience to the school. We had the opportunity to speak with Lisa and talk about her experience as a program manager at our St. Petersburg location, and she had some great insights to share! Lisa has carried a love of cosmetology and barbering with her from a young age. Her father used to bring her along to the barbershop for his regular appointments, and Lisa always loved the sights, sounds, and smells of the barbershop. Her mother did the same thing and would bring her around to the salon. Lisa went to cosmetology school right after high school to begin her career as a professional cosmetologist. Since that time she also earned her master barber license and has been working hard in the industry ever since. She joined AIB shortly after it was founded more than 15 years ago and has been an integral part of the school. The school just wouldn’t be the same without Lisa and the amazing work she does! When Lisa was asked what makes AIB special, she started talking about the hands-on learning environment at the school. For her, cosmetology and barbering aren’t just about haircuts or styling, it’s about making someone’s day. This passion for serving other people is something that Lisa strives to bring to the learning environment at AIB. Lisa focuses on helping students to learn how to provide excellent and compassionate service so that clients will always want to return. This is why she encourages students to attract new clients and build their own book of business before they’ve even completed their beauty program! Lisa’s advice for future students is to think carefully to determine what you’re most passionate about. Some people may be more interested in hair, others may like men’s services, and others still may want some of everything. One of the easiest ways to find out what you’re interested in is to visit the school. Lisa enjoys helping people find what they love, so she’s the perfect person to be educating our Future Professionals! Learning cosmetology, barbering, and skincare are great ways for many people to get their start in the world of beauty. Do you have a passion for helping other people and making a difference? Contact American Institute of Beauty, Inc. to learn more about how our programs in Largo and St. Petersburg can help you reach your dreams!